Last night I met up with a friend for dinner. We got talking about this blog and at one point during the conversation she said, 'On the Internet, everyone has a voice'. And that's completely true. Whether we're writing a blog, commenting on someone else's, sharing a link with friends or just liking something on Facebook, we all have something to say, and the Internet gives us an easy and quick way to do that. In fact, often having your say online is a lot less scary than doing it in person. Yesterday's post was about the dangers of this and how, if that voice isn't used wisely, it can get us in big trouble. But today I'm going to turn that around and look at the other side, the way in which we can use the Internet and the power it gives us to make a positive impact, not only on those who read it but on our own futures. Today, I'm going to blog about blogging. Why do people start blogs? Originally they were online diaries (web logs, hence 'blog'), used by those who were going travelling and wanted to keep their friends and family back home up to date on their adventures. But nowadays they're used for everything from sharing a hobby to giving advice, documenting a life experience or even something as simple as a day-to-day journal. Some blogs become big news, like Never Seconds, in which ten-year-old Martha Payne from Scotland shared photos of her school dinner every day, and scored each one out of ten. Martha hit the headlines when her school told her she had to stop blogging. Since then she's raised a staggering £129,000 for charity, won several awards and just yesterday she met the president of Malawi. Other blogs are read by just a handful of friends and family. But they all have an impact. People subscribe to blogs because they want to read the next update. They comment because they have an example or opinion they want to share. Maybe they don't agree with a post and want to start a discussion. And so the blog becomes not just one person's voice, but a community. A good friend of mine, Sian, is moving to Turkey next month, and decided to blog about her preparations and the adventure ahead. Over time she realised she had more to say than just talking about the move, so now her blog tells a more general story about her life, her cats, her Bucket List and her travels, among many other things. It's funny and genuine, and I highly recommend that you take a look at To Fethiye and Beyond. And what's great is that through the blog she's met new people with common interests, who she'd never have known otherwise. These new friends come from all over the world and have offered to help her fulfil Bucket List items, and offered her reassurance and encouragement that her move is going to be a good one. Sian's also just heard that her blog won a Best Moments Award - not bad going for someone who's only been writing for six months! 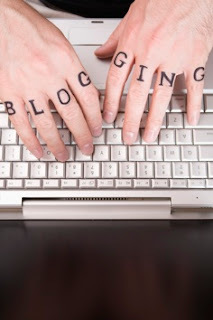 By starting a blog you can also raise your own profile as an authority on a particular subject. Katie, another friend, started Musings of Guitargalchina to blog about films, a long-time passion of hers, just over a year ago. She wanted to get into film journalism and her blog gave her the chance to start writing, developing her style, and meant she had something to show to potential editors. Through promoting the blog to fellow film fans and bloggers, Katie's now written for five other sites and is a regular contributor to three, sharing her thoughts and opinions on the world of TV and film. Her blog has hundreds of followers and she's part of a thriving online community, regularly coming into contact with journalists and others within the film industry. Writing the blog has also given her confidence in her own ability and style. Maybe you're worried that you have nothing to say. Not true - we all have hobbies and interests, and we all have something to say about them. Or maybe something really annoys you, and you just need to get it off your chest. There are almost certainly others out there who feel the same and will be happy to join the discussion. You don't even have to write if you don't want to - take pictures, make videos, record podcasts. All these are just as valid and will allow you to get your voice heard. Try to find an angle that hasn't been covered before; that way your blog will be unique and is more likely to get noticed - because after all, as I pointed out yesterday, on the Internet you never know who's paying attention. But even if you don't make headlines, it's ok. It'll look great on your CV, and you might make some new friends. Those people will care what you have to say, and that's a great feeling! If you have a blog that you'd like to share with everyone, please let us know in the comments.